Essay: Why we’ll never get rom-coms to change. The rom-com continually tells us that perfection exists. And thus, often sets up unrealistic expectations for love and relationships. I saw the film What If somewhat recently and found myself perturbed by the nauseatingly perfect ending. This is a film that spent a good deal of its narrative time setting up the implausibility of Wallace (Daniel Ratcliffe) and Chantry’s (Zoe Kazan) union. After all, she had a long-term boyfriend and he didn’t want to be the jerk to come between them. But the ending, with its musings on marriage and love lasting forever reverses any sense of originality hitherto established. Sure, it’s quirky and offbeat, peppered with cutesy animations and macabre witticisms. Yet, for all it’s intentions to carve out a new territory in rom-com history, where a man and a woman could just be friends, or where marriage doesn’t have to be the ending, it fell at the last hurdle into a hackneyed puddle of traditionalism. Which begs the question, will rom-coms ever change? Even those deemed the most original and self-reflexive seemingly can’t help but reinstate conservative values. 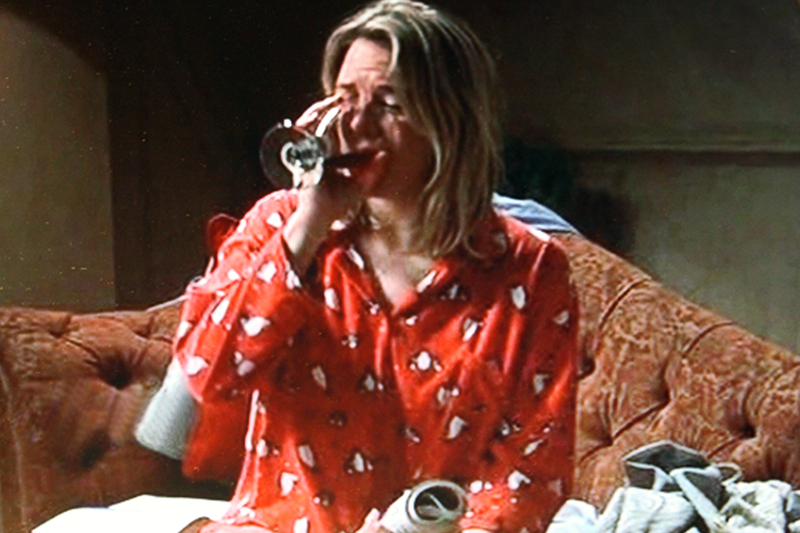 Girls Night In: Wine, PJs, and a Rom-Com? The romantic comedy is the genre most frequently relegated to the ‘guilty pleasure’ league; associated with girls nights’ in, boyfriends being dragged unwillingly to the cinema and accompanied with a glass of wine and a box of tissues. Commonly known as a chick-flick (a term denigrated by connotations with effeminacy, sentimentality and melodrama), these are the films berated as ‘fluff’ that we turn to when we wish to mindlessly, passively consume a piece of entertainment; to switch off from all that is real and serious and indulge in pure escapism. For decades, the rom-com has been positioned as the zenith of a utopian cinematic experience, as possessing solely the capability to reaffirm our belief in true love, but doing nothing to subvert, challenge or provoke. In recent years, several films have been released – chief among them 500 Days of Summer – that engage with the shifting culture of courtship and aim to depict relationships more realistically. However I would argue that the contemporary romantic comedy, though flaunting complexity, reflexivity and originality, and flouting traditional modes of representation, is merely the same present in different wrapping paper. Some examples that come to mind – Nick and Norah’s Infinite Playlist, Save the Date, I Give It a Year, Peace Love & Misunderstanding, Going the Distance. They all point to difficulties in relationships and marriage and try to undermine the notion that ‘forever’ is really forever. And yet, problematically, they all revert to the sense that happiness can never be truly achieved without a significant other. They perpetuate the myth of ‘the one’. No matter how strong the claim to difference and challenging generic and cultural norms, these films reinstate the power of the couple, the valorisation of love to functionality and normality and that deviance from this pattern results in unhappiness. Ultimately we leave the cinema with a heightened awareness that relationships aren’t easy, but that ‘the one’ will materialise anyway. I would argue that the romantic comedy is more complex than historically-defined, yet ultimately restores dominant values and seemingly can’t help but do so, as central to its very plot is the notion of meeting someone with whom to fall in love. Another generic trait seen in rom-coms is the idea that the couple are meant to be together and that their personalities are perfect matched – either because of common interests, or because opposites attract. 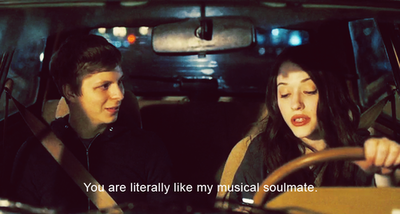 In Nick and Norah’s Infinite Playlist (2009, Peter Sollett), Kat Dennings’ character seems attracted to Michael Cera on the sole basis she shares his music taste and enjoys the mixed tapes he’s been compiling for an ex-girlfriend. In Serendipity (2001, Peter Chelsom), the meet-cute between Jonathan (John Cusack) and Sara (Kate Beckinsale) occurs in Bloomingdale’s as they both try to purchase the same pair of cashmere gloves. This narrative contrivance is indicative of paths aligned, a moment of destiny that these two people were absolutely meant to meet. Rom-coms perpetuate the notion that there is a male glove to fit every female hand and that the compatibilities and connection between the two protagonists is enough to prevail over any narrative obstacles. In 500 Days, this is immediately shot down by Tom’s 12-year old sister who asserts that “just because a girl likes the same bizarro crap as you doesn’t make her your soulmate”. Moreover, the narrative fragmentation and flashbacks serve to show how these compatibilities can deteriorate. Tom and Summer bond over shared jokes in IKEA, their love of The Smiths and vinyl records and whereas, conventionally this might be played over a montage to convince the audience of the couple’s inherent perfection for one another, 500 Days replays these scenes to depict how the jokes become stale and that these sparks, that rom-coms convince us are enough to sustain a relationship, can begin to fade and grate. 500 Days is, in some respects, unconventional and more complicated as it reveals an inherent distrust of the durability of the relationship. Indeed, my favourite moment of the film occurs when Tom’s expectations are pitted against the reality in a split-screen sequence, underscoring it’s belief that true love is perhaps a fantasy. Moreover, 500 Days continually attempts to foreground its diegetic realism; emphasising that the characters inhabit the real world, as opposed to the utopian fantasy world of stereotypical rom-com characters. Indeed, Tom laments to his two best friends that ‘it’s off’ between him and Summer, though could’ve been ‘on’ “in a world where good things happens”. His friend replies “that’s not really where we live [though]”, as if to ensure the audience are aware 500 Days operates outside of rom-com normality and takes places in the same world as they inhabit. This tone persists to the denouement wherein the opening scene, day (488), plays again, but now with the audience awareness that the relationship has failed and Tom and Summer were simply not meant to be together. As Katherine Glitre asserts, “the fact of the happy ending has conventionally been understood by critics to prove the conservative nature of the genre; a movement from stability through disruption to the reaffirmation of the status quo” (1). Henceforth, that Tom and Summer don’t end up together would confirm the unconventionality of the film and a subversion to our expectations for the genre. And yet, equally, it does exist in a world where we are expected to suspend disbelief at the fact he meets a girl called ‘Autumn’ after things with Summer ended. Furthermore, diversion from a standard happy ending is hardly a panacea to the ills of the romantic comedy. That Summer converts from cynic and anti-relationship proponent to the married woman believing in fate alludes to the underlying conservatism of 500 Days, and its reversion to generic norms. Whilst 500 Days eschews traditional narrative methods, it still invokes the possibility of a happy ending. Though not achieved between our two protagonists, Summer gets married to her ‘Mr. Right’ and Tom’s encounter with Autumn promises transition and achievement (a new season, a new job). It’s as if 500 Days functions as the prequel to two different love stories. One can easily imagine Summer’s story as to how she met her husband “reading Dorian Gray in a deli” as the meet-cute for a more standard rom-com. Though they weren’t right for each other, Summer’s final revelation authenticates the film’s belief that fate does exist and that had she not been sitting there on that particular day, she would never have met her husband. Steve Neale (1992) has pointed out that, “the wrong person provokes the learning process, which the protagonist must undergo in order to realize a successful relationship”. 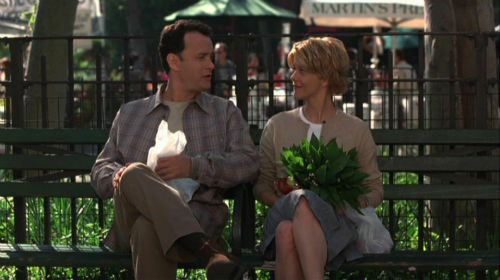 This is seen in You’ve Got Mail, wherein Kathleen Kelly (Meg Ryan) and Joe Fox (Tom Hanks) begin the film in relationship with other people ill-suited to them or lacking in passion, as if to provide the justification behind their covert-bordering-on-adulterous-conversations and instigate the learning process that they are better off together. Equally, in When Harry Met Sally, Harry and Sally are set up with mutual friends on a date, however the friends have more in common with each other and therefore act as the ‘wrong people’ for Harry and Sally to realise they are meant to be together. Tom Hansen is Summer Finn’s ‘wrong person’ and thus the film relocates the focus of the typical rom-com, but still utilises certain conventions. Arguably the success of the rom-com now lies in a retelling of a traditional narrative with a heroine, or protagonist who eschews Hollywood convention and is more relatable. This can be observed in Bridget Jones’ Diary (2001, Sharon Maguire), in which Renee Zellweger plays the slightly overweight, unlucky in love, every-woman with whom we can sympathise exponentially more than a leggy Julia Roberts, for instance. They may both, ultimately be rewarded with their version of a fairty-tale ending, but the rom-com’s allegiance to utopia is traded in for a grittier, and more honest, portrayal of love in a contemporary context. Female characters nowadays tend to reflect a more forward-thinking romantic comedy that isn’t afraid to allow women to dictate their own lives and pursue sexual desires. Deschanel’s Summer initiates their physical relationship when kissing Tom in the copy room, as opposed to the traditional belief that a girl should wait for the guy to make the first move and is shown to know her own mind: “I’m just not comfortable being somebody’s girlfriend. I don’t want to be anybody’s anything”. Summer makes a change from the ‘Manic Pixie Dream Girl’ who permeates a raft of contemporary romantic comedies, serving the purpose of merely helping the male protagonist realise his own dreams. Although the criticism of vapid eccentricity and constructed kookiness is often levelled at Zooey Deschanel and in 500 Days she often encourages Tom to pursue his architectural ambition, she also refuses to be his supporting role and breaks out of the mould of ‘ideal woman’ that Tom cocoons her in. She very explicitly states that she only wanted a casual relationship and does not stick around for the purpose of giving meaning to Tom’s life. Nevertheless, even the modern woman requires a man to ‘complete’ her. Or so rom-coms would have us believe. Most films of this quirky, whimsical ilk (look to Save the Date for a frustrating example), go to great measures to depict their female protagonists as strong, independent women, resistant to conformity and the oppressions or conventions that a relationship might impose. And yet more often than not, these women come running back to a man. Sure, in Going the Distance, Drew Barrymore did it on her terms and much like the love story between Jane Eyre and Mr. Rochester it was about the equality between sexes and achieving a balance, rather than advocating singledom as the way forward. Yet I can’t help but feel that the modern woman has become a scapegoat for conservatism, a way for rom-coms to appease a younger, flirtier and more liberated audience, whilst still espousing the belief that love conquers all.. Having discussed the various factors that contribute to the conventions of the rom-com, I now wish to explore the appeal of this genre, as here is where the engrained belief of the rom-com as a guilty pleasure lies and still exists rampantly. Gerald Mast explains that the films in the genre create a comic climate through a series of cues to the audience: subject matters are treated as trivial…and characters are protected from harm. Even though the drama poses serious problems, such as choosing a life partner, the process appears light-hearted, anticipating a positive resolution. Therefore, the appeal of the rom-com lies in our preconceived belief that we will get a happy ending. We don’t want surprises in this genre – perhaps diversions or digressions – but as long as it comes good, we’ll be satisfied. I believe audiences are complicit in the rom-com’s occupation of this academic space, and preserve its connotations with easy, uncomplicated viewing. I tested this view by asking several friends and peers to comment on their opinion of the romantic-comedy – whether they found it to reinforce stereotypes, or rather reflect a realistic and refreshing portrayal of modern love. This provided a varied qualitative response, which is at odds with much of the academic criticism I have read and overwhelmingly situated the rom-com as pure entertainment or sleepover fodder; the appeal being they can be trusted to deliver saccharine escapism. The problem with the rom-com then is that it’s very genre expectations appear to undermine complexity – the happy ending being intrinsic to the rom and a cheerful tone required for the com. The assumption of cultural lowliness that has traditionally accompanied the genre has led most to reduce romantic comedies to guilty pleasures, an “unworthy” object of analysis for academics who generally belittled it either by omission or simply through plain derision, regarding it as simplistic, predictable and hopelessly associated with a conservative view of love and marriage. Indeed, the rom-com is an apolaustic genre with an ingrained expectation for a contented or uplifting feeling upon viewing. Despite moulding conventions to suit a new era, where casual relationships are de rigeur, as well as being very much aware that its creating a love story – or not, as 500 Days would have us believe, at its core this film retains the formulaic sentiment that somehow once you’ve found the person you’re meant to be with (suddenly Summer ‘just knows’ what she was never sure of with Tom), your life will fall into place. 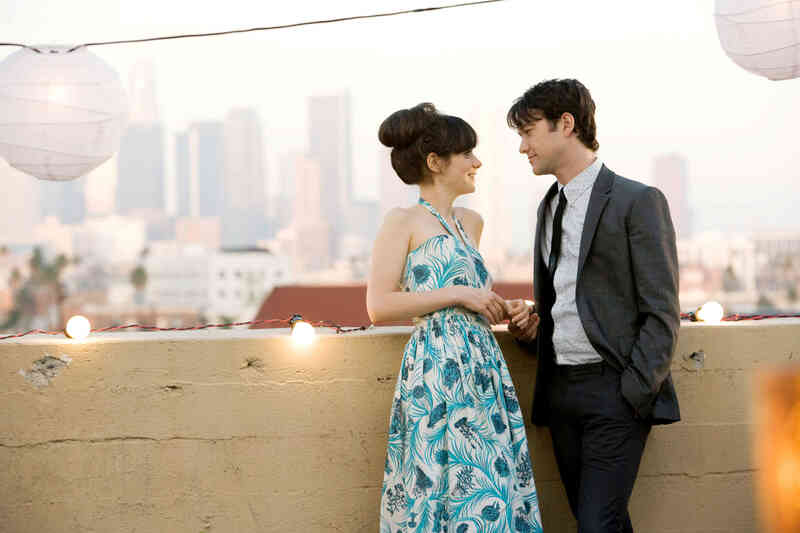 It’s for this reason that I deem 500 Days of Summer (and those that attempted to imitate its success) to play by rom-com rules – even if recycling them. Though attempting to challenge it’s audience and try to display love and relationships in a more authentic way; their heart of gold, upbeat tempo and feel-good music leaves us feeling very much like we watched a good old rom-com.